There is a motion if the vector changes over time. We can thus note this dependence . The variation of position is thus the motion. Noting the position of the object P1, P2, P3, … at consecutive times t1, t2, t3, … , we can introduce the displacement vector as the vector , and if the objects continues to move, , etc. the position is the addition of the previous position with the displacement . the displacement equals the sum of the displacements and . it may look obvious, but there is always one position more than there are displacements. As a result, it is impossible to determine the position of the object from its displacements alone. We will need at least one of its positions. We introduced here the addition operator + on vectors. In the Cartesian system, it is easy to see that the addition and the subtraction operators are simply the mathematical + and – operators applied on the numbers corresponding to the coordinates. Now that the displacements are defined, we can consider that it doesn’t take the same time to make the displacement between P1 and P5 directly or with the intermediate steps. The average speed is defined as the displacement by unit of time. At the initial time t1, the object was at the position P1 defined by the position vector . 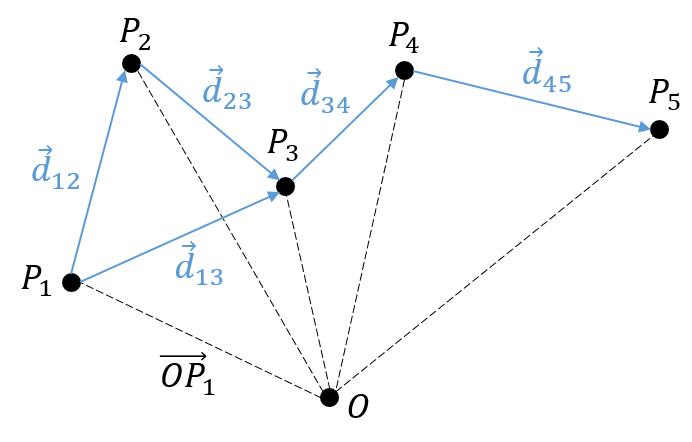 At the time t2, the particle has moved from this position to the position P2, defined by the position vector . The average speed between these two positions is thus the displacement of the object divided by the interval of time t2-t1. One concept is now to get rid of the two positions to define an instantaneous speed, associated to a given position and a given time. To do so, we will bring the second point closer from the first and see what happens. We can’t only chose one point because the division by zero is not allowed. However, if this ratio continues to exist when the two points are almost identical, then the instantaneous speed is this value. It is also the definition of the derivative of the position with regards to the time, calculated at t1. The limit towards zero of Δ will be noted d to obtain the notation corresponding to the usual derivative. Each component of the speed is given by the derivative of the corresponding component of the position with regards to the time. 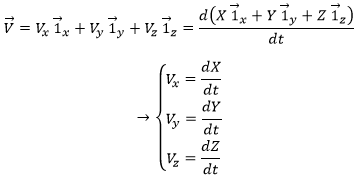 and the instantaneous acceleration as the derivative of the speed vector with regards to the time. As the acceleration is a difference of speed, there is thus always one acceleration less than there are speeds. From a speed at a time t1, on can determine the speed at a time t2 if we are given the acceleration during the interval of time. the sum ∫ is defined between a point of beginning and a point of end. A uniform rectilinear motion (URM) is obtained when the speed of the object doesn’t depend upon time. The speed is thus constant and is defined at the initial time t0. As the speed is constant, the acceleration is thus zero. The equations for the position in each direction correspond to the equation of a straight line in the three dimensions space.